5.5x5.5 (MEDIUM) - 10-15 letters or 5 magazines. Reserve a box online at elmwoodselfstorage.com then come in the office to present ID and fill out a PS Form 1583. Once the ID is verified, the application is approved and we receive payment, we will provide your box address, key and begin your service. Please note the application process can take up to 48 hours. Stop in the office to present ID and fill out a PS Form 1583. Once the ID is verified, the application is approved and we receive payment, we will provide your box address, key and begin your service. Two valid forms of identification are required when you obtain your keys. You must present the IDs at a to the Elmwood Self Storage Office in person. One item must contain a photograph and one must be traceable to the bearer (prove your physical address). Both must be current. PHOTO ID OPTION: Valid driver’s license or state non-driver’s identification card Armed forces, government, university, or recognized corporate identification card Passport, passport card, alien registration card, or certificate of naturalization. NON-PHOTO ID OPTION: Current lease, mortgage, or deed of trust Voter or vehicle registration card Home or vehicle insurance policy. Payment is due on the same day of the month that the box was opened. It renews monthly unless you decide to take advantage of prepay discounts. Your account doesn’t automatically renew in 3, 6, 12-month terms. It is your responsibility to pay on time. Once a box is 5 days late mail will be held and late fees will apply. Payments can be made in person at the Elmwood Self Storage and Wine Cellar office. Monday-Saturday from 8:30am-6:00pm and Sunday from 9:00am-1:00pm Cash, Credit Cards and Checks are accepted. Payments can be made online by going to www.elmwoodselfstorage.com. Your box number, email address, and gate code will be needed to start an online account. Credit Cards and ACH checks are accepted online. You can not make prepayments online. 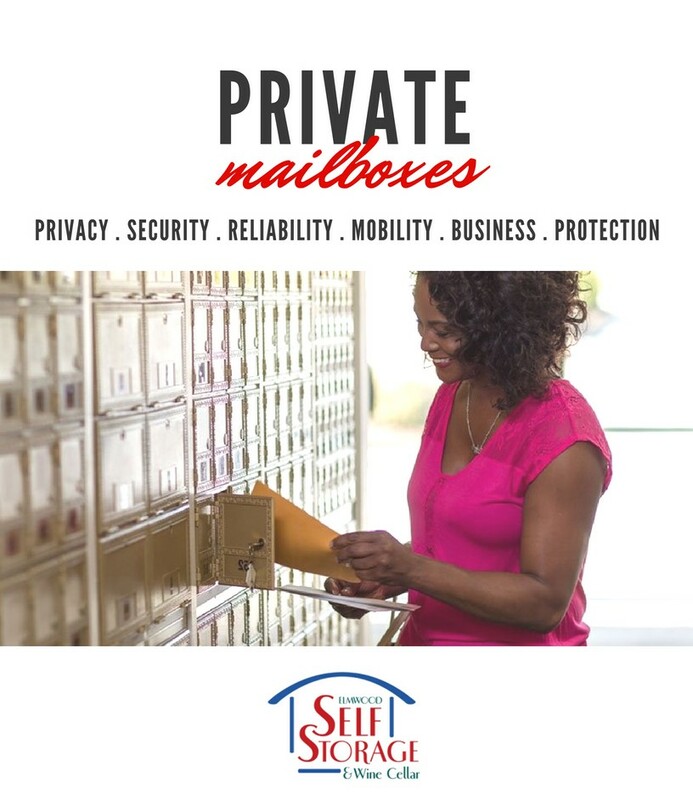 Payments can be mailed to Elmwood Self Storage and Wine Cellar 1004 South Clearview Parkway, Harahan, LA 70123 Please make sure you mail payment far enough in advance to arrive before the due date. Late fees still apply for lost or late mail payments. Do not mail cash. One key is issued for your private mailbox. An access code is provided for current storage customers only to have 24-hour access to the box and for access to the online payment system. A refundable key deposit of $10.00 is due at rental and refunded via check after you vacate the box and return the key. Check refund can take up to 4 weeks to process. In the event you lose your key there is a $25.00 Lock Change Fee. A lock change request must be filed with the office. This could take up to 24hrs to process. Once the lock is changed you will need to pick up your new key from the office. ESS will only forward(Re-Mail) your mail if you have terminated the box in good standings and have prepaid for the service. 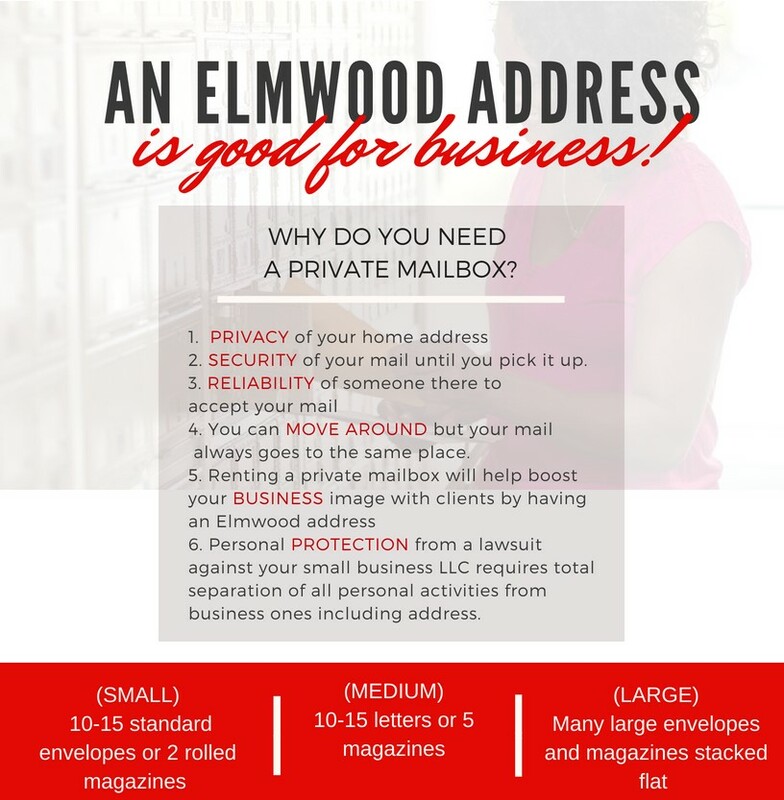 $5.00/month/package, only if you have requested mail forwarding services before termination of the box. No Packages will be forwarded only letter mail. Elmwood Self Storage and Wine Cellar storage customers will have 24hr access to the mailboxes, via their gate code and access via the 24hr door from the storage hallway.